This week Awesome Stories brings you reading to dogs, walking for love, focus tips, teaching kindness and feeding the hungry. Shelter Buddies Reading Program is a new program where kids read to shy and fearful shelter dogs. Over time, the dogs come out of their shells and learn to trust humans. Similarly, the kids learn empathy by noticing their impact on the dogs. Kids can sign up online, be trained and then read to the dogs with adult supervision. The dogs have greatly improved with higher adoption rates which is one of the goals of the Missouri Humane Society. I love this program! Who doesn’t like being read to? Maybe it will spread to schools as curriculum or at least extra credit. What do you think? I know I’m easily distracted online, bouncing from one interesting social media post to the next, then email, articles and personal accounts. Then the next thing I know an hour or more has slipped by. Much of the reading feeds my soul and is fodder for Awesome Stories, but still I’d like to be more intentional in how I work online. This article outlines the ways we are distracted online with our short attention spans and offers three basic tips; more water, exercise and digital-free time. I’d also like to see more ideas for how to work effectively online. For me, it helps to prioritize my tasks, do one thing at a time and limit my online time. What works for you? I love that kindness is being taught in schools. The Center for Healthy Minds created a kindness curriculum for kids and introduced it to 6 schools in the midwest. They believe (and I agree) that teaching kindness could impact our schools, teachers and kids dramatically without the need for big policy changes. Kindergarten students were introduced to stories and practices about mindfulness, emotions and kindness. 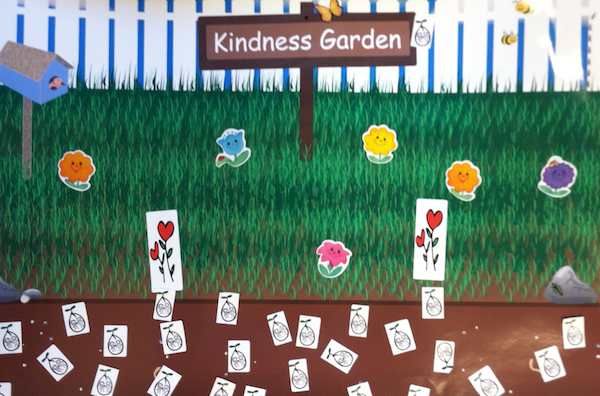 For example, kids were taught to plant seeds of kindness, adding their seed to the garden, growing a garden full of smiles, caring and kindness. Early results show promise with the kids testing higher, especially on social and emotional scales. Steve Fugate has been walking across America for about 14 years covering more than 34,000 miles in the process. His journey started with the grief of losing his son to suicide, but gradually evolved as he did to spreading a message to love life. He also lost his daughter to an accidental overdose in 2005. Through walking and being open, he has gradually come to be a spokesperson for love reminding others that they don’t have to give up and take their life. He is continually amazed at the kindness of people as he walks around the country. So far he has walked through 27 states and circled the US about 6 times. He never asks for money, only for food and a place to charge his electronics so that he can keep in touch. Keep on brother Steve! What began with a simple email expressing disappointment in the service at a restaurant, led to a life changing experience for Darshan Chandan. He refused the offer for free food from the restaurant and asked them to feed the needy instead. They did and sent him a photo of the happy kids. This sparked the idea to go feed the needy in a nearby slum in Vadodara, Gujarat. This simple idea led to the BhookMitao campaign which has grown to feeding 1200 children daily with the help of 600 people. They do it all with volunteers and donations, no money is accepted. They ask people to get involved and organize them with a clever app and a lot of dedicated work. Darshan has clearly found his passion. You’re welcome. Have a great week Annette! This post has so many awesome things that I don’t know where to begin! The humane society idea is genius!! I love that the kids can read to animals and develop empathy. And later on, they’ll be their advocates. I’m checking out the focus tips site, too. I’m not online as much these days because of my day job, but I also make conscious decisions to also limit my time. And delve into other projects. The kindness curriculum is something I’m going to look into as soon as I finish this comment. I am always looking for ways to incorporate character lessons and development into our after school program. So, this is awesome! And the walking for love. Holy cow! This is fabulous. I LOVE to walk and have to check out Steve’s story even more. Thank you for finding, compiling and sharing these stories!! I agree with the above comments, so many great stories in the post. I LOVE kids reading to the dogs in shelters! I hope to see more of that. And I so relate to the short attention span in this digital world…I’ve started to leave my phone at home when running short errands. At one point I contemplated not having wifi at home, but that might be going too far. 🙂 Thanks Brad! What awesome stories! I particularly liked the one about the kids reading to the dogs, and the man who inspired the free food for needy people. Thanks for sharing, Brad. You are most welcome. I’m glad these stories touch you too. Awesome as always…..reading to dogs is real intriguing…love the concept. Focus tips…I limit my online time….I keep to a pattern of definite down time….clears the head and helps refocus…I also prioritize and list what I want or need to accomplish and don’t let myself get sucked away form the list…just some thoughts..take care, Brad!! Kudos to you Kirt. I’m not as disciplined about my time. That’s an area for me to improve. Thanks for contributing. Wonderful post dear Brad.. so loved each of those video’s to see those children reading and the gods looking intently 🙂 and the video on the Trail Therapy wow.. what a guy.. such wisdom and yet I still see the pain he carries for his son.. Many thanks my friend.. I see our paths crossed while I was looking at the videos 🙂 Not surprised at that 🙂 hehe..